One of the strongest number sequences ever produced by Stuttgart-Zuffenhausen is celebrating its 50th anniversary this year: the Porsche 917. The most famous racing car of all time made its debut at the Geneva Motor Show on 12 March 1969, and the Porsche Museum is celebrating the landmark birthday with plans to restore the first 917 ever made to its original condition, as it was when first unveiled 50 years ago. The 917-001 underwent various changes over time. “Our approach to the authentic handling of classic cars has changed considerably over the past ten years,” explains Achim Stejskal, Director of the Porsche Museum. When restoring vehicles from the company’s historic collection, the museum places great importance on retaining original material and taking into account the relevant history of its exhibits. 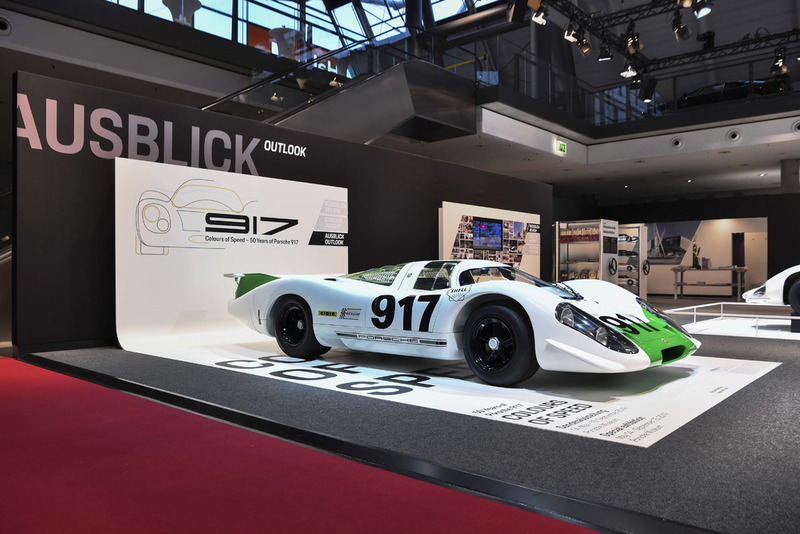 Exactly 50 years on, the 917-001 was being presented at the Retro Classics in Stuttgart, restored to its original condition as in 1969. The 917-001 marked the beginning of an unparalleled racing car career for the 917. The 917-001 Group 4 sports car, designed to sweep the board at the 24 Hours of Le Mans and win the Brand World Championships, was the first of the 25 vehicles that had to be made to meet the requirement for type approval; the chief designer on the project was Hans Mezger, who was responsible not only for the twelve-cylinder engine but also for the vehicle as a whole. The 917-001 was presented for the first time in Geneva in March 1969, with its bodywork in white with a green front section; it had a new look for its appearance at the International Motor Show in Frankfurt the same year, for which the car was repainted in white and orange. When Porsche later announced the transfer of its racing activities to the J.W. Automotive Engineering team, headed by Briton John Wyer, the 917-001 was once again used as a presentation vehicle – and refinished in the brand colors of US oil company and sponsor, Gulf: light blue and orange. Following its first clean sweep at the 24 Hours of Le Mans, the 917-001 was then reworked into the short-tail version by Hans Herrmann and Richard Attwood in September 1970; when the 917-001 was handed over to Porsche Salzburg in October 1970, it was in the colors of the car that won the Le Mans race and was emblazoned with starting number 23. For over a year, museum mechanics, former technicians, and engineers from Zuffenhausen and Weissach, as well as the Historical Archives and partner companies, worked on the restoration of this original 917. The project was particularly challenging from the outset because of the multiple transformations the car had undergone during its time as a test and presentation vehicle. The top priority throughout was the conservation and reuse of the car’s original materials wherever possible and technically practicable. The restoration was particularly guided by testing which was able to determine which of the body materials were original and could be reused, using material analysis and comparison with historical design drawings and photographs. It was with this approach that the body parts for the front and rear sections were painstaking reproduced using state-of-the-art 3D technology and with reference to the original design drawings; the rear section of the aluminum space frame was also restored with the aid of original documents. Exactly 50 years on, the 917-001 will be presented in the Porsche Museum, restored to its original condition as in 1969. The success story of the 917 is legendary. The car managed to secure an overall victory in its very first year of competing in the 1,000-kilometre race at Zeltweg, Austria in 1969. In 1970, Hans Herrmann and Richard Attwood achieved the coveted overall triumph at Le Mans – the greatest motorsport success Porsche had ever achieved until that point, and which would be repeated by Dr Helmut Marko and Gijs van Lennep in 1971. Following further development of the 917 to the 917/10 and 917/30 turbo versions with over 1,000 PS, George Follmer, and Mark Donohue were able to dominate the North American CanAm Series in 1972 and 1973 respectively; these Porsche models also proved unbeatable in the event’s European counterpart, the Interserie. An altered version of the turbo technology was also reused a little later in a Porsche standard vehicle – when the 911 Turbo was born in 1974. From 14 May to 15 September 2019, the Porsche Museum will honor the 50th anniversary of the 917 with an extensive special exhibition entitled “Colours of Speed – 50 Years of the 917”. A total of 14 exhibits – including ten 917 models which alone have a combined PS output of 7,795 – will be on display. The Porsche Museum will present a 917 concept study to the public for the first time as homage to the first Le Mans victory of 1970. The red-and-white show car was designed by a small team of designers and engineers, though with the entry of Porsche into the LMP1 category of the FIA World Endurance Championship (WEC), this model remained as purely a concept study. A selection of racing posters and small technical exhibits will round off the special exhibition, which features the highest-ever total PS for such an event. To mark the anniversary, the museum shop will also offer a selection of 917 products for sale, including a pink barbecue apron inspired by the unique 1971 917/20, nicknamed the “Pink Pig”. Edition Porsche Museum, the in-house publisher, will also release a book to mark the anniversary of the 917.